You think you know what is going to happen next. Your plan is not flexible enough. Failing to understand the strengths and weaknesses of technical analysis. Government and central bank intervention. Anyone who suffered through 50%-plus stock declines in the periods 2000-2002 and 2007-2009 can tell you that bear markets can cause many sleepless nights. 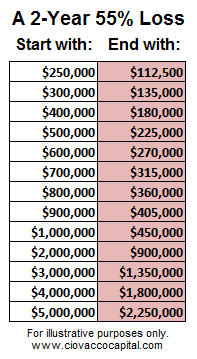 The table below shows how damaging a bear market can be to your future plans of relaxation and retirement. Our analysis below uses charts. Does that mean the fundamentals do not matter? Absolutely not. The interpretation and perception of present day economic activity, earnings, Fed policy, etc. are what drive the charts and determine asset prices. The charts help us monitor the present day “read” on all the fundamental data which includes expectations about the future. The previous sentence aligns with the expression the fundamentals are captured in the charts. Fundamentals and people determine asset prices; not charts. Charts are a monitoring mechanism. As we outlined on March 12, trends speak to investor conviction about the economy and markets. 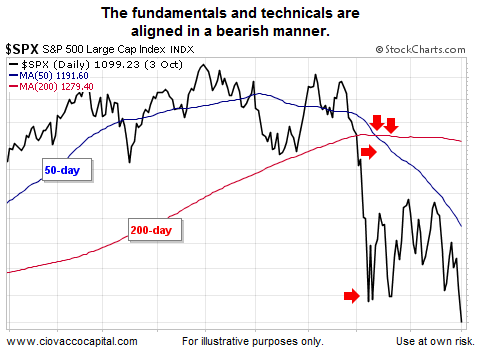 The 200-day moving average is used to monitor the health of the long-term trend. 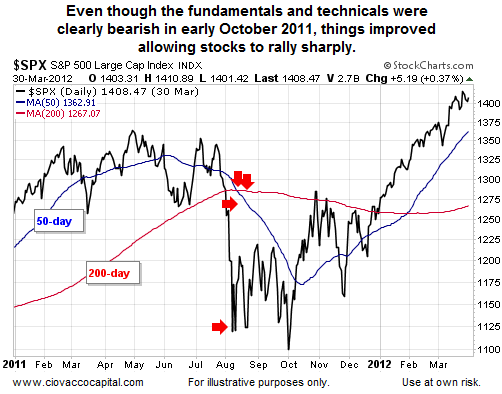 The 50-day moving average is used to monitor the intermediate-term trend. The S&P 500 chart below shows what a “full bore” bullish market looks like, when bullish economic conviction is clearly outpacing bearish economic conviction. The positive slopes on the blue and red moving averages align with investor expectations that the economy will continue to grow. In the early stages of a bear market, the tipping point is reached when the net aggregate perception of future economic outcomes shifts to the bearish camp. When the stock market’s trend is tentative, it indicates a shift in the aggregate economic outlook of all investors around the globe. The negative slopes on the blue and red moving averages align with investor fear and concerns about the economy. You do not need to know anything about technical analysis to see the differences in the two charts above. 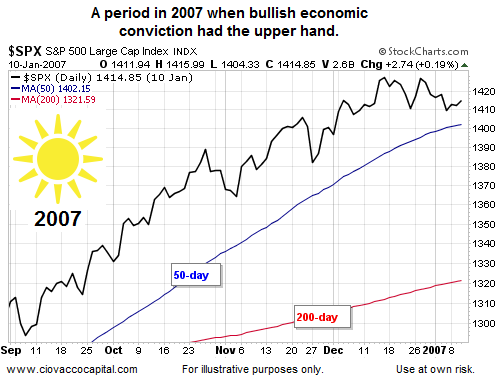 All things being equal, the odds of investment success are higher in stocks when we have the “sunny skies” look. 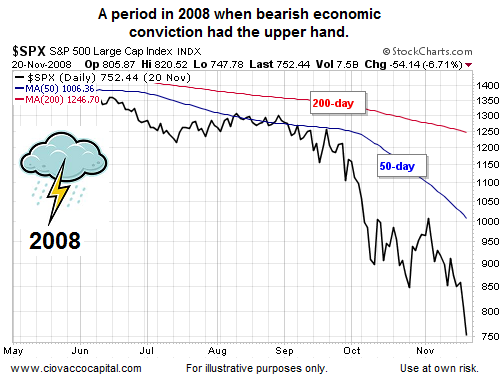 Conversely, the odds of success in stocks drop significantly when we have a “stormy sky” look. The bullets above tell us the fundamentals are shaky in our hypothetical quiz scenario. The technicals for our quiz period are shown below. 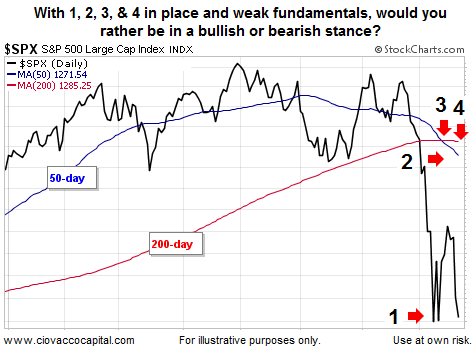 Our quiz chart looks like the early stages of a bear market with (1) S&P 500 below both its 50-day and 200-day moving averages, (2) bearish slope on 50-day, (3) 50-day below 200-day, and (4) bearish slope on 200-day. If you have made up your mind that a new bear market has started, then if the evidence begins to shift, you will start viewing everything through a lens with a bearish bias. The chart below shows what happened next. Stocks did not enter a new bear market. Instead, they rallied over 27% in the next six months. What happened in 2011 to flip the playing field from risk-off to risk-on? Europe was a mess at the time and policymakers and central bankers intervened. While there were many factors that led to a big rally in stocks, the most significant was the European Central Bank’s unlimited three-year loans to ailing financial institutions. If market intervention is successful in turning the sentiment tide, then improving economic data may not be far behind. In August, European Commission President Jose Manuel Barroso warns that the sovereign debt crisis is spreading beyond the periphery of the eurozone. The yields on government bonds from Spain and Italy rise sharply – and Germany’s falls to record lows – as investors demand huge returns to borrow. On 7 August, the European Central Bank says it will buy Italian and Spanish government bonds to try to bring down their borrowing costs, as concern grows that the debt crisis may spread to the larger economies of Italy and Spain. The European Commission predicts that economic growth in the eurozone will come “to a virtual standstill” in the second half of 2011, growing just 0.2% and putting more pressure on countries’ budgets. The IMF cuts growth forecasts and warns that countries are entering a ‘dangerous new phase’. Will We See Intervention In The Next Crisis? This is a topic for another day. However, experience tells us that those in power (elected representatives, government leaders, and Fed governors) want to stay in power (get reelected or reappointed). Nobody, including Fed Chair Janet Yellen, wants a crisis to occur on their watch. The political party in power never wants a weak stock market or weak economy heading into mid-terms or a presidential election. When push comes to shove, history tells us it is highly unlikely those currently in power will stay on the sidelines as stocks and the economy drop, putting their positions in jeopardy. Russia remained on collision course with the West over Ukraine’s separatist Crimea region as six hours of talks between the country’s top diplomat and his U.S. counterpart failed to ease tensions. President Vladimir Putin “is not prepared to make any decision regarding Ukraine until after the referendum on Sunday” on joining Russia, U.S. Secretary of State John Kerry told a news conference after the meeting in London today. Russia “will respect the will of the Crimean peoples,” Russian Foreign Minister Sergei Lavrov told a separate news conference, saying there’s “no common vision” on resolving the crisis. In the U.S., economic data came in weaker than expected. A report showed consumer sentiment in early March declined to 79.9, the lowest reading since November. Separately, a measure of producer prices for February fell 0.1%, bucking forecasts for an increase. 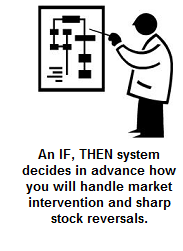 Our market model incorporates the concepts of thinking in probabilities and flexibility by converting known information about the big picture into an IF, THEN system. The model called for a second incremental step to reduce our equity exposure (SPY) Friday. Our core positions continue to be SPY and technology stocks (QQQ). This week our allocation to stocks contracted and our cash position expanded. The market remains in a more vulnerable state, but bearish conviction is not yet strong enough to carry the day, which can be seen in the flattish nature of the S&P 500’s 50-day moving average below. 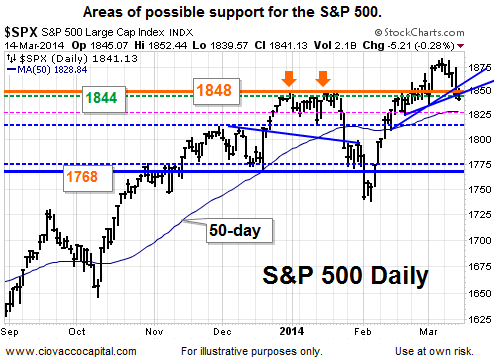 The market’s current profile requires a high degree of flexibility. With a Fed meeting on this week’s docket, we must be willing to increase or decrease our equity exposure based on the incoming data and evidence.